This week was certainly a big one for DJ O$AP and Goldilocks! As many of you already know, Starboy is finally here! Quite possibly the biggest musical day of the year for the two DJ’s, since their common love for The Weeknd is the reason this radio show exists! There’s been half a week’s worth of talk and debate about this highly anticipated album and you can rest assured that they were not disappointed. Eighteen brand new songs, with the exceptions of the four premature releases, and a single seductive interlude featuring the lovely Lana Del Ray. 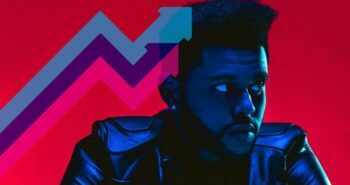 The Weeknd kept the feature list pretty simple with Starboy, but there’s no let down when you see the names Daft Punk, Future, Kendrick Lamar and a sneaky untitled feature of Sam Smith in the song Sidewalks. If you didn’t get to see the anxiety provoking teaser trailer called M A N I A that the Weeknd released just before the album came out, there’s a link below where you can check it out! It was almost torturous to watch short clips of his new unreleased songs just a few hours before the official album release, but the high intensity of the video clips in the trailer were once again, surpassed all expectations! It’s safe to say that the music world is in agreeance that the new album is good… but how good? Does it compare to those timeless songs we heard on the album Kissland and the mixtapes from Trilogy? Well, after admitting Goldilocks was a die-hard Hilary Duff fan, and O$AP has been in love with Ellie Goulding since early high school, it was agreed that both DJs’ music taste heightened when they found a mutual love for The Weeknd. The early productions of The Weeknd are what defined their new favourite artist; his unique sound and vibe setting him apart from any other artist on the market. It would take a lot for The Weeknd to top his original work, and after much debate Goldilocks and O$AP have decided that they need more time with the album to truly decide if it is on par… stay tuned each week to stay updated on their debates! Angel, from Beauty Behind the Madness is arguably one of The Weeknd’s most original, ear-catching songs ever released. The vocals and lyrics of the track provided The Weeknd with an anthem that truly resonated with his fans. The biggest question about the new Starboy album is which song, if any, is able to compete with Angel? Thus far, Die For You stolen the hearts of both DJ’s but unfortunately does not quite measure up to the Angel standard. Though the track really gets those university emotions flowing, it just doesn’t seem to hit as hard as that heartstring-plucking anthem Angel. It’s easy for the DJ’s to give their opinions on the album… but how is the rest of the world feeling about The Weeknd? Well, it’s safe to say Starboy is destroying the music charts and held the #1 spot in 80 countries within a mere 24 hours after release! Looks like it’s a lot more than just Goldilocks and O$AP that are falling in love with these tracks. He has taken over the music charts, claiming 18 of the top 20 songs! On a far less important, but still awesome note, O$AP got a new phone! To end this week’s show, the DJ’s had a quick discussion about the new Google Pixel and the awesome new V.R. features it holds. For those who don’t know, V.R. or “virtual reality” is an exciting new technology that’s getting noticed fast. It’s a visual and audio experience that places you in a new virtual graphic world where a V.R. headset accessory allows you to interact with the simulated environment. It even has zombie games! Um, NO! Goldilocks and O$AP won’t be tough enough to play those games for quite some time. They’ll be taking the much more relaxing, scenic route for now… enjoying the simulated butterflies and calming lakes! If you want to learn some more and check it out, take a look at some of the links and videos down below!